Pimple Clear Micellar Water is enriched with the unique Lock and clear technology found in the Pimple clear range (Thymol and Terpiniol). It is especially designed to be used on pimple proned skin. Aqua, Hexylene Glycol, Glycerin, Niacinamide, PEG-6 Caprylic/Capric Glycerides, Propylene Glycol, Trideceth-9, Tetrasodium EDTA, Citric Acid, Salicylic Acid, Sodium Chloride, Terpineol, Thymol, Fragrance, Benzophenone-4, PEG-40 Hydrogenated Castor Oil, Cetylpyridinium Chloride, Phenoxyethanol, Cetrimonium Chloride, Potassium Chloride, Alpha-Isomethyl lonone, Benzyl Alcohol, Benzyl Salicylate, Citronellol, Hexyl Cinnamal, Hydroxycitronellal, Limonene, Linalool. 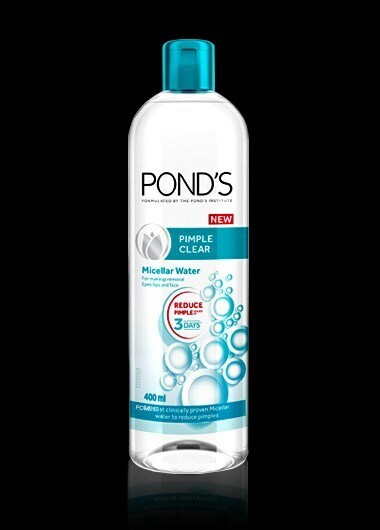 Pond’s Pimple Clear Micellar Water has made my life so much easier as it quickly removes makeup, leaving my skin thoroughly cleansed and pimple free. It’s non-irritating formula is perfect for sensitive skin and reduces breakouts. The Micellar water is perfect for removing makeup! You just one cotton pad, possibly two depending how much make up you are wearing, but it removes makeup with ease and leave the skin fresh and clean! I love that it leaves my skin glowy and dewy too. I've been using this product for a month now, day and night and in the 1st week I had a breakout and the next day my pimples virtually disappeared! Have you ever had no acne scarring just because you didn't even have enough time to scratch? I have! Absolutely love the way all my makeup is effortlessly removed. This product will be a keeper in my makeup removal routine. This product is so good and much easier than makeup removing wipes. My skin feels instantly relieved of all the makeup from the day that gets wiped away.